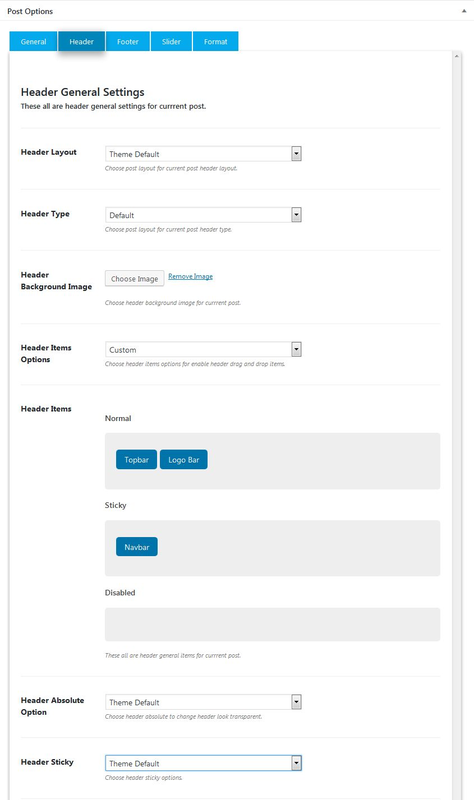 Header option allows you to enable/disable the header and select its background options. These all are header general settings for current post. Header Layout: You can choose your header layout has “Boxed” or “Wide”. Header Type: Select your header type for matching your site (default, Right sticky, left sticky). If you choose right/left sticky, then default header options are hide and not working. Only work “Header Sticky/Fixed” part options. Header Background Image: Choose your post header background images. Header Items Options: Choose your post item has “Custom” or “Themes Default”. If you select default, custom options are hide and not working. Header Absolute Option: You can Enable/Disable header absolute option to show transparent header for page. This option only looks good when slide immediate item of header. Header Sticky: You can Enable/Disable sticky part to sticky which items are placed in Sticky Part at Header Items. Items like (header sticky part, sticky scroll up, none and default).